The Union Jack waves cheerfully over this intimate, British-themed hotel in an ideal spot for exploring San Francisco's Union Square and environs (the cable car stops one block away). Upscale shopping from Barneys to Neiman Marcus and the Curran and Geary Theatres are within strolling distance. 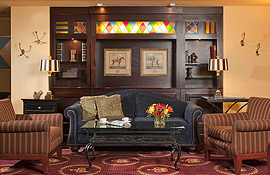 Charming and whimsical in the heart of San Francisco with a modern new design and best-in-class service and amenities. Statues of Richard the Lionheart’s lions flank the beveled-glass doors, opening to a lounge filled with books, warm lighting and cushy armchairs. The rooms are decorated in cheerful yellow tones, with English country prints on the walls, and they're well-insulated against the activity in Union Square. Satisfy your late night sweet tooth: each room comes with a candy jar full of treats. Winston’s Bar and Lounge serves wine and beer, with Happy Hour specials and a large screen TV to catch the Giants' games. The hotel's meeting space holds up to 40 people, and The Moscone Center is five blocks away. The King George Hotel is one block off of Union Square, steps from Union Square's shopping and dining. The cable car line is one block away on Powell Street. Cancellation required at least 1 day or 24 hours prior to arrival date to avoid one night penalty charge plus tax.